Social innovation is inescapably intertwined with power. However, in practice, power is not always or often discussed. Recently, others have noticed this power unconsciousness too and have been offering provocations about the role of power in co-design: who holds it, what dynamics are at play in co-production, and the lack of education about power in design curricula. Acknowledging there is a lack of nuanced understanding of the role of power in co-design is an essential growth step for the sector. This acknowledgment also begs more questions: what does that awareness mean for our practice? How can we increase our understanding of the implications of power within co-design work? How might we design projects to take power into account and fundamentally shift power imbalances? I’ve been curious about how we take these questions further, make the role of power explicit, hold ourselves accountable to the forces that are at play in creating better outcomes, and lift this power unconsciousness from the social innovation sector. A while back, I was invited to facilitate a session at Peer Academy’s Co-design Symposium. Motivated by George Aye’s article on Understanding the Role of Power as well as questions from and conversation with other practitioners, I wanted to offer a provocation on how we begin to equip ourselves with power literacy and actively reflect on power in social innovation work. I developed a game for a one-off workshop purpose and received an unexpected response. 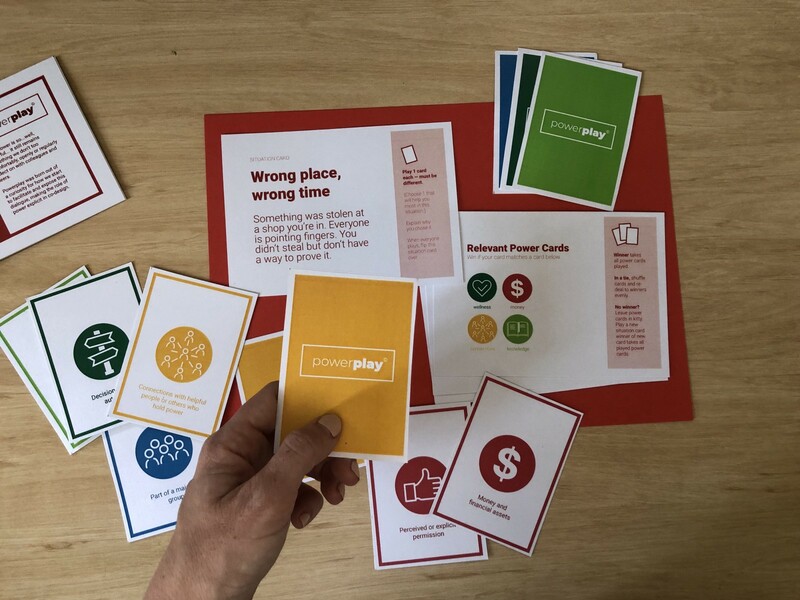 After playing the game, people said things like, “This is the first time I’ve ever thought about my own privilege and actually talked about in the context of my work,” and, “You’ve just made the invisible visible for me.” Since that day, people have approached me asking to download, buy, use, and share the game — hence this post. 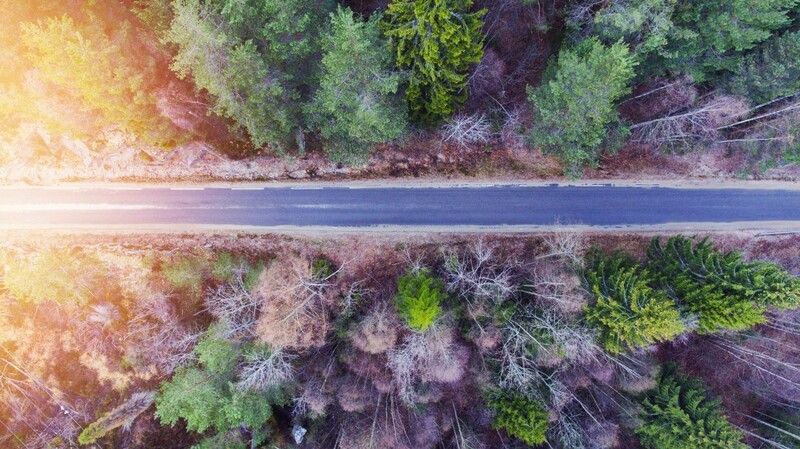 In this post, I offer some methods and mindsets that can shift the power-play, transfer ownership, and create space for people to self-determine the solutions and policies that will affect their lives. 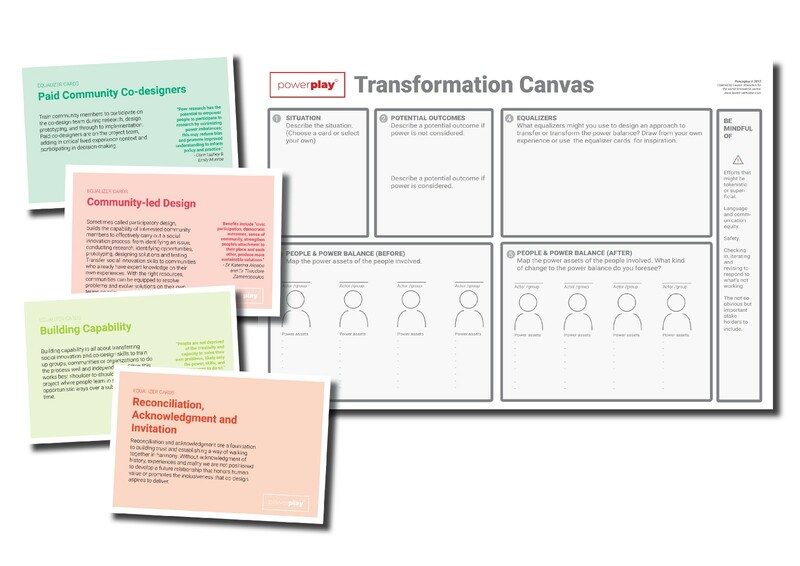 For longstanding practitioners or enthusiastic emergent designers, this article shares inclusive tools to foster dialogue and purposeful action around a topic that’s too important to sidestep but often is. In its simplest expression, power is the ability to influence an outcome. Social innovation is all about using multidisciplinary approaches to unlock better outcomes and reduce inequality. In social innovation, we’re trying to create new solutions or systems to categorically change outcomes for people living below the poverty line, improve the wellbeing of older people as they age, or change the outcomes for kids who didn’t get the best start to life, strengthen the accountability of government to taxpayers and voters, the list goes on. Social innovation aims to design ways to influence outcomes for the better, and power is a crucial element of that dynamic. For a discipline that is aiming to equalize the playing field and reduce inequity, a recognition of power in our work and ways of being is essential. In social innovation or social design, co-design is a commonly used method intended to bring people affected by an issue into the process of understanding the problem and designing a better response. As co-designers, or as commissioners of co-design projects, briefs guide the project parameters to help populations in a position of less to move into a position of more. As a result, social innovators are afforded power in the way projects commissioned, granted, and set up: they receive a significant amount of funding, perceived permission to do the work, decision-making authority, etc. The communities that social innovators work with often do understand how situations could be improved but may not have the permission, funding, and authority to enact that change. These communities are often experiencing situations compounded by historical trauma, colonization, systemic violence, institutional racism and social constructions of privilege, which further the power imbalance between project leads and beneficiaries. And if that power imbalance is not acknowledged from the outset, power unconsciousness too easily puts co-designers/social innovators in a position to impose solutions on communities. Even if solutions are developed with the best of intentions, ultimately decision-making (about the project shape, approach, outcomes, etc.) sits in the professional designer’s hands. The risk is that decisions are made, with good intent, but based on assumptions or the level of information that people are willing to contribute given the power dynamic. If power and the implications of power imbalance are overlooked, social innovators can become extensions of what sociologist C.W. Mills calls the power elite — the few businesses, organizations and governments who can influence decisions (usually for their own interest, the interest here is “better outcomes”). The risk is that “better” is determined for people, no by — edging on neocolonialism. Before entering the design arena, my background was in sociology and community development. Those disciplines (and others) have a literacy around power and privilege and their role in influencing life chances for individuals and communities. As co-design and social innovation venture into more and more complex social issues and systems change, drawing from social science disciplines that have theoretical models around power will become increasingly important. I’m actively trying to be more aware of the implicit and subtle effects of power, especially how systems and social constructions perpetuate power imbalances. I experience certain privileges because of the power myths that surround the body I’m in, the color of my skin, social capital I’ve acquired, and my professional position. I know that these power imbalances are not subtle at all, they are likely experienced deeply, physically and overtly by people on the other side of that power. My colleagues and I at the Australian Centre for Social Innovation (TACSI), are consciously making efforts to restore the power balance through genuine co-design work so that people who might be benefiting from or using services, policies, systems are the ones who are actively shaping and owning them. Powerplay consists of 10 power assets (cards) that are prominent in Western societies. Some of these assets can be created or earned; others are inherited, most are social constructs. The reality is that we all have a power inventory made up of such assets (i.e. being part of a majority group, financial stability, inherited privilege, effective communication, ability, and wellbeing). Some people have a big inventory, others have a small inventory. The size and variety of your power inventory impacts on how many decisions you can make about your life. 1 When power is unequal, it imbalances who has the agency to act. People with a more diverse range of power assets can be more selective about which assets they use when. People with fewer assets have fewer options and less agency to influence the outcomes in their favor. The more power you have, the easier it is to get more. This is the silver lining: We can reposition power, and, quite frankly, in co-design and social innovation, we have an obligation to do so. There are practical steps we can take to restore the power balance (to a degree) when designing, commissioning, or delivering a social innovation project. bringing on people with lived experience to join our project teams as equal contributors to process and practice. If we’re committed to social innovation, we must also be committed to self-determination, decolonization and dismantling the mechanisms that systematically breed racism and unearned power. Strengthen the capability of others to do co-design work now and into the future, rather than claiming to be the only experts who can hold practice expertise. Shift the decision making power into the hands of people with the lived experience of the issue, or at least, sharing the decision making power rather than making decisions amongst other consultants behind closed studio doors without community. Collectively foster conditions around initiatives to politically, financially and strategically ensure the long-term sustainability of solutions, rather than designing initiatives, ending projects, and hoping for the best. Recognize everyone’s role in shifting social outcomes. While work can be self-determined by communities, the responsibility to change public perceptions and systemic architecture can’t be a burden that community is expected to carry and resolve alone. Build relationships, trust, and partnerships with stakeholders who have influence and are affected by these projects rather than swooping in and out. Co-design that seeks to establish safe power balances has the potential to change the systems that perpetuate silence, inequality, and disadvantage. I’m calling together thinkers, leaders, and doers to further this conversation and commit to a future of inclusive practice — use these, share these, evolve the dialogue and influence the next generation of co-design practice. You can download the free materials mentioned in this article below. The game is a prototype — I’m still learning too! I’m keen to hear what you think and how you’ve used it. I am fully aware that this is an extraordinary topic to take on. I am not claiming silver bullets or comprehensive knowledge. There is so much more to say and existing work to build upon. There is so much to be sensitive to and to be bold about. I am certain I haven’t gotten this 100% right, and I’ve been hesitant to share this for that very reason, but I hope in its current form, it provides some value and provokes constructive discussion too.